DC53 or SKD61. And materail is choosed according to customer's requirement. This workpiece is composed of two cylinders, the tolerance of two cylindrical roundness and concentricity is 0.005 mm, the connection of the discharge surface and the grinding surface can not have a step and ensures smoothness. B. Material: Stainless steel / aluminum / brass / iron / zinc / high speed steel / copper, etc. C. Any other material and product size depends on customers' demand. D. Usage: We offer precision mold parts for manufacturing, and products can be used in many industries such as automotive, electronic equipment, aviation, medical and so on. 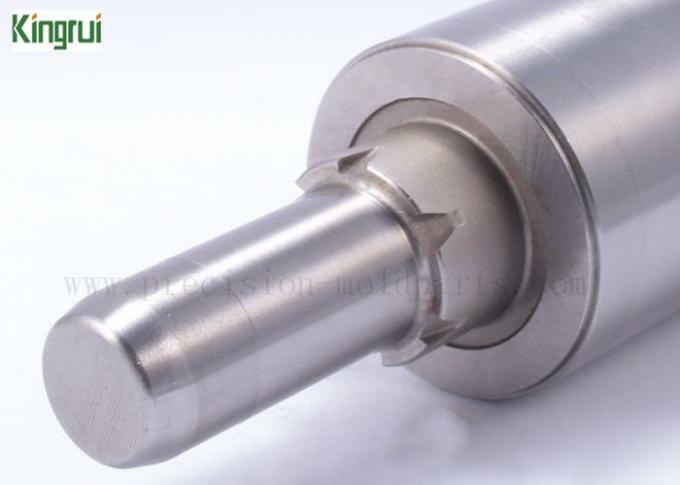 E. Manufacturing process: lath machining, cnc machining, linear cutting, stamping machining, discharging processing, grinding processing and so on. F. Euipement: CNC milling machine, CNC machine, grinder, EDM machine, WEDM machine and so on. G.Testing equipment: 2.5D projector, Japan Nikon Height Gages and other gages, two dimension, hardness meter and so on. J. Delivery Time: In generally 5-15 working days, it depends on the quantity of order and complexity of drawings. K. Shipment: By land/ by air/ by sea. And we have cooperated with a number of global international courier , such as TNT, DHL, EMS, Fedex and so on. If you have any questions, you can contact us anytime. -------Our team will help you solve problems within 12 hours.